This generation’s console wars have been raging since the year 2006, when the Playstation 3 came out and mucked everything up! Just kidding about the PS3 part, but this has been an issue since both consoles were out and people had to choose which one they wanted. Not everyone was able to afford both due to the high prices of the consoles on release, so people began comparing them – picking favorites – and slandering the other as best they could to justify their choice. In the article I’m going to discuss the details and pros and cons for both the Xbox 360 and the Playstation 3. I will not be including PC since it’s not really a console, and I will not include the Wii either since that’s not really a proper console. ZING! But really, I hate the Wii and it’s not even comparable to the others anyway so it wont be mentioned unless I make a bad joke about it. Anyway, on with the show. The Xbox 360 was released on November 16, 2005 in North America as the successor to Microsoft’s first system, the Xbox. The 360 was releases with the ability to connect to Xbox Live (XBL), which allowed players to play online with other players around the world as well as download movies, music, and more through Windows Media Center – which is compatible on the 360. You can also download games and lots of other things through Xbox Live, making it quite the interactive experience. If you remember, playing online was small time until this generation’s consoles came out. On June 18th, 2010 Microsoft released a redesign of the Xbox 360, the Slim model. 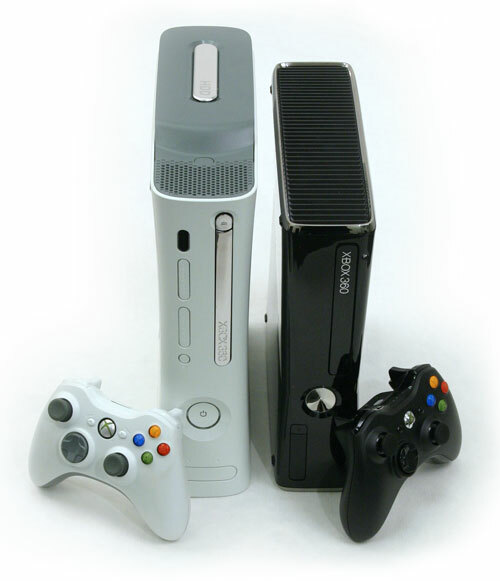 As seen to the left, the Slim model is the black console and the white one is the original 360. The Playstation 3 was released on November 17th, 2006 in North America. 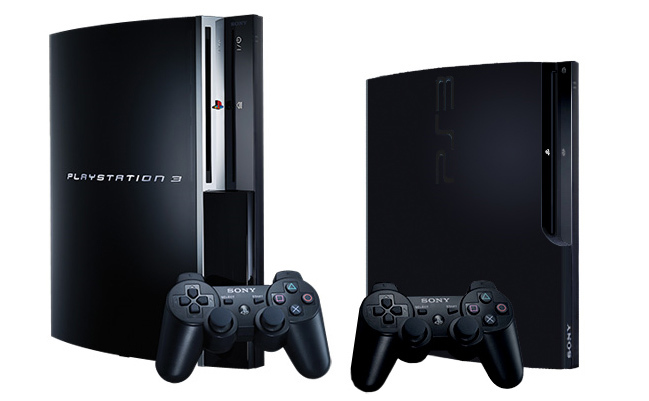 The PS3 is, obviously, the third system made by Sony following the Playstaition and the Playstation 2. The PS3 was released with it’s own online system, the Playstation Network (PSN). The PSN, much like XBL, allowed players to download games and play online with one another. On September 1st, 2009 Sony released the PS3 Slim, show in the picture on the right, next to the original model. The Slim model is a, well, slimmer model of the original but it also has less features and more memory, I will delve into those specs later though on the pro’s and con’s section. Pro’s and Con’s of both systems will be listed here, these are basic pro’s and con’s, I don’t plan on getting deep into the technological aspects and hardware specs. To date, the Xbox 360 has more games than the PS3. Xbox Live features cross game chat, which allows players to get into a chat party regardless of what game they are playing. So I could be playing Mass Effect while my friend plays Halo 3 but we can still chat. Ease of access to the main menu while gaming or watching movies. Avatars. On the 360 you have an avatar which you can customize to look like you or your favorite game character. You can see your friends avatars and while in party chat the avatars have specific animations that make it look as if they are actually chatting. Until recently, the 360 has always been available at a lower price than the PS3. Microsoft brand wired controllers are available for those who don’t want to deal with charging the controller or changing the batteries. The Kinect. A control-free way to play games. User removable HDD. Anyone can get a new harddrive and just pop in on, or in, and game on. More apps. You can get a variety of apps on the 360 such as MSNBC, Netflix, Hulu, Zune, YouTube, Last.fm, and much more. Heat is an issue with any console, but as an owner of both consoles I must say that the 360 puts out more heat than the PS3, which can lead to overheating of the console. XBL costs money. You have to pay to enjoy the features of online gaming and downloading. The “red ring of death”, or RROD, is not as much of an issue with the new slim console, but if you haven’t upgraded you will live in constant fear of the day you get the RROD and it renders your console useless. This issue used to be a major problem, but at warranties are ending on older consoles, people are still worried and are still affected by this. Disc tray. The 360 has a disc tray which can lead to the scratching of discs, loudness while game is being played (if it’s not installed), and it’s a hazard if left out while people are walking around. Point system on XBL. To buy games, themes, DLC, etc. you need to purchase points. That may not seem so bad until you realize that you can only buy points in specific increments (400, 800, 1600) and if what you want is less that what can be bought you still have to pay. So for example, if I want a game that is 500 points I have to buy the full 800 points to get it. There is no 500 point pack or 100 that can be added to the 400. So basically, you are forced to waste money. Noisy fans. Regardless of whether your game is installed or not, the 360 will still be much louder than the PS3. Graphically, the PS3 can handle more than the 360 so they may appear less crisp and tidy on the 360. Blu Ray compatibility. You can watch your Blu Ray movies on the PS3 and all the games are made on Blu Ray discs, allowing them to store more so you don’t have to have multiple discs for longer games like on the 360. Quiet. The Ps3 is super quiet 99% of the time, if it ever gets a little loud it because something is downloading and even then, it’s more quiet than the 360. PS and PS2 games. The first released version of the PS3 was backwards compatible, allowing you to play PS2 discs on you PS3. They have since done away with that feature though. You can download PS games on the console itself. You can do this with the 360 as well now with Xbox games, but PS3 made this more available first. More exclusives. The Ps3 does have more exclusive games available for it, unlike the 360 which only has a few main titles that are exclusive. The ps3 is generally known to have better exclusives as well, most likely due to the large variety. Free online gaming. The PSN is free, so you can get online and play online for free. There is a paid version called PS+ but it is not necessary for online gaming. No disc tray. The PS3 does not have a disc tray which makes it quieter and less hazardous, it also wont scratch your discs. Real time money for online purchases. On the PS3 you pay with your money, not points. If I want a game that is $13 I will pay $13, not $20 and then have a bunch left over. There is a minimum amount with is $5 I believe, so if you are buying something cheaper than $5 you are stuck. The Move. A much better version of the Wii’s sad little motion controls. Better graphics in general than the 360. No cross game chat. You can only chat with friend if you are playing the same game since there is no party chat available cross game. Smaller community. So if you are on at 4am you may have a hard time finding other players. No access to messages or the main menu at all when watching a DVD or Blu ray. Until recently, the PS3 was always much more expensive than the 360, making it less of a priority to purchase. The hack. OK, I didn’t want to go here, but I think it’s necessary. The PS3 did get hacked not too long ago which knocked the PSN out for a month or 2 (maybe longer?) and exposed some of the users’ credit card info to the hackers. This was a major breach in the PSN’s security and lowered the trust of PS3 owners to Sony. Hardware is supposedly better than the 360. The harddrive can be tricky to replace for non-tech savvy people. Both consoles are very good, and honestly I love owning both. There are pro’s and con’s to both, obviously, but overall it’s worth it to invest in owning both consoles. I hope that in the future 360 owners and PS3 owners can be friends, but it’s like cats and dogs – it’s rare to find them hanging out. 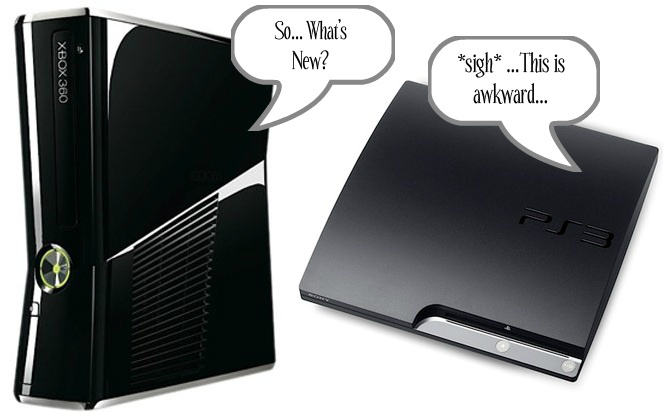 I like to use this analogy: The PS3 and the 360 are much like Star Wars and Star Trek. Both are great, but most people just seem to like one more than the other, although there are those who like both and they are the ones who are the happiest as they can enjoy both freely. So there you have it, I did the best I could to get the best info I could. But I may be wrong in some points. Please let me know if anything should be added or subtracted. Thanks! I hope next gen consoles will be more similar and better in all aspects 🙂 We can only hope though at this point! I have owned both consoles and ended up selling my ps3. I enjoy online play as my main form of gaming and I think Xbox just did it much better. Also I might add that glitching games and data is much easier on ps3. I gave my psn account a 10th prestige in mw2 in less than 10 minutes without having ever glitched anything before and Xbox is a bit more complicated to be invasive like that. All in all I like your article a bunch.